2 of 6 Break spaghetti into thirds and cook 8 minutes. Drain and add back to pot. 3 of 6 Stir in the pasta sauce, mozzarella, Canadian bacon and olives. Add the eggs; stir mixture until combined. 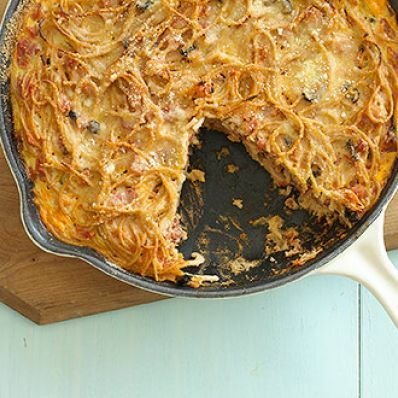 4 of 6 Coat a 10-inch cast-iron skillet or oven-proof nonstick skillet with cooking spray. Sprinkle the inside of the skillet with the bread crumbs. 5 of 6 Spoon the spaghetti mixture into the skillet. Bake at 350 degrees for 30 minutes. Top with the Parmesan cheese and bake for 10 minutes. 6 of 6 Cut into 6 wedges. Serve with a green salad tossed with reduced-fat dressing, if desired. Makes 6 servings.